I give it a 4 star the presentation of the shoe is wonderful. I absolutely love the way the shoe looks. However, if your foot is wide, you may want to upside your shoe size. They are very narrow and can hurt. I like the shoe very much. So glad I used wisdom and upsized. I have one pair of these shoes and just bought another - I like the style, fit and comfort - they are very light weight and good for walking - I would recommend them. I absolutely love these shoes so much that I now have several pairs in different colors. They are stylish, comfortable, and look good when wearing slacks or jeans. Also they are true to size. I definitely would recommend these shoes. Love Cole Haan and Stitchlite. I've never had a problem over the years with any of the shoes I've purchased. I love Stitchlite - just bought my third pair. So comfortable without socks. I wear them all the time. My last pair were in a different fabric. For some reason I find them to be more comfortable. Perfect length and width - light weight and extremely comfortable. Very pleased. Fit is excellent, they are really comfortable, they actually look dressy with the right slacks and I walked all over Europe in these (and a gray pair). Great looking and super comfortable..
My favorite shoes! Super comfortable and well made. I receive many compliments, especially on my grey pair. Did I mention I have them in three colors? Haha! Buy them ladies! Worth every single penny! My go-to, best-ever walker and stylish, too. This is my third pair, two I keep as backups so I know that I will have them around for a long time. Can't imagine finding anything better. Extremely comfortable and just what I was looking for!! I have 2 pair of these, one white from last year in a 9 and black form this year in a 9 1/2. I think I am a 9 1/4 . . . that being said, I wore the black 9 1/2 for the first time last week and had them on for 9 hours, they were great. No break in needed and my feet didn't hurt a bit. I would recommend this shoe without reservations! A perfect shoe. Great looking, and one of the most comfortable shoe I've ever worn. I bought these shoes because I admired them on a friend. Another friend admired them on me and ran to Coke Haan to buy them in two colors. I searched for months for a supportive, stylish, and comfortable shoe to keep pace with my walking heavy lifestyle in Chicago. I severely sprained by ankle almost two years ago and ever since I've struggled to find any shoe that didn't cause ankle soreness. I was honestly skeptical that this shoe was the answer - but it totally is. The upper Stitchlite wraps my foot perfectly and it is completely breathable. The soles are cushioned yet supportive. I wear sock liners with these - oh and I was able to fit a removable orthotic (I just trimmed the foot ball area to account for the shoe's shape). It took about a week to perfect the lacing so the shoe tongue didn't rub the top of my foot. It never got to the point of blisters but just took a bit of breaking in. My solution was to change at which point the laces with through the leather tongue loop. I wear these shoes daily often walking miles all over the city on pavement. They look great with jeans and can easily be dressed up. I bought the black(white sole) and plan on buying at least one more in another color to have more options. They are the best! This is my 3rd pair different colors. Love this shoe! Excellent fit. I will probably get another color soon! I purchased these shoes at a convention show in New York hoping they would be comfortable to walk the show, I happy to report I was not disappointed! They are not only comfortable but look very sharp and stylish! Well done Cole Haan, I will be buying another color, most likely the light pink very soon! They feel like socks very comfortable . you wont even notice youre wearing the sneakers because of how light they are. Read about it on Smarter Travel as the best travel shoe for women. I have these in baby blue and also the Stitchlite wool in grey. My boyfriends sister loved them and since I think they are the most comfortable shoes ever, these will make a great Xmas gift! I need a stylish shoe that has support and zero grand shoes give me that! I love these shoes the fit, color and style, this is my seventh pair. 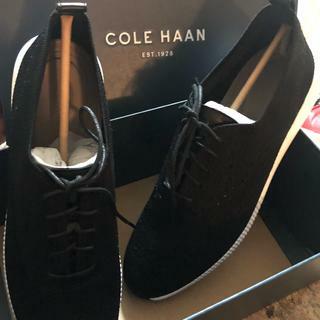 I have very flat feet and all Cole Haan fit me like a glove, thank you. STORE DIDN'T HAVE MY SIZE IN THIS COLOR; GREAT FIT AND ENOUGH SUPPORT FOR LONG PERIODS OF WALKING IN EUROPE. This is a classic sneaker that you can basically wear with anything! Style and reviews. I plan to use them for stylish travel. I have them in grey and they’re spectacular. SUPER comfortable and the compliments just keep rolling in each time I wear them! Now I want ever color! My friend has them and she said they are the most comfortable shoes she ever had. Looking for a light weight travel shoe that is not a traditional sneaker. Hopefully it will have good arch support. Just received a pair. Can’t wait to wear. I have a pair of the beige color and I absolutely love the comfort! The style is different too and sets apart from other shoes. I already own the same shoes in a lighter color and I love them. They are so comfortable, and I wear them with everything, even to work some days. I was looking forward to buy a new pair in a darker color. I have the suede version and they are so stylish and comfortable, but my dog ate them. So I decided to try a similar style in a different fabric. I have a pair of Stitchlite sneakers that are the most comfortable shoe I own. Wear them walking all over the city. Will likely be my new go-to walking shoe when I commute into work, plus its black will go with any outfit I wear! It's offered in size 10.5, which is not that common. Hope it fits! I bought one pair of these and have to have it in another color. These are sooo comfortable. I bought them for an upcoming trip to Italy but also wear them to work. They are so versatile. I hope to add more colors to my collection! I have several pairs in multiple colors and they are the most comfortable shows I own! I wear them with skirts, capris' shorts etc. Tried it on in the store but they didn't have the color I wanted in stock. Because they truly are great looking and comfortable! most comfortable shoe on earth! I have two other pair, gray and blue, and I love them! BEST ANSWER: We like the answers from the Margaret and Rosemary! Both methods are recommended. Use a soft, dry cloth to loosen and remove dry soil. For marks or stains, use a damp cloth with a small amount of liquid detergent added and dab at the stain. Occasional application of ScotchGuard is a good idea on fabric footwear. Thanks, Gals! Will it fit with orthotics? BEST ANSWER: This shoe is incredibly comfortable without orthotics. However, if you need orthotics, it is narrow shoe and may not fit comfortably inside. I would think a wider base shoe would be needed. Hope this helps. I am pretty sure it would, because the fit is pretty loose so I think you could get an orthotics in the shoe. Good luck and hope you love them as much as I do! Because the insoles in most of our footwear are usually permanently secured to the footbed of the shoe, it will not easily accommodate orthotics. It depends on the type ... i had a custom orthotic and i don’t think it would work . Maybe just an insert though . Could you tell me please wether these shoes are appropriate for 30 minute daily jogging/running on pavement? I need a shoe I can wear to work but also run in! BEST ANSWER: While we think it's great that you want to look sharp while working out, this is a fashion style - not an athletic shoe. It is very comfortable and flexible, but it does not offer enough support for jogging, running or other similar outdoor activity. The Stitchlite uppers are made with knitted material - will not hold your foot in place. Keep these in the closet for social activities! As a runner i would not run in these. They are a comfortable shoe but not supportive enough for a long run. How high is the heel of this shoe? BEST ANSWER: The are pretty flat. I wouldn’t consider them the have a heel as they are more like sneaker/loafers. They do run big. I thought they would run narrow due to the style so I went up in size but here weren’t! Closer to true to size. The thickness of the sole at the heel end is approximately 1".